What Are Crayons Made of, How Did the Crayon Get its Name, and What Does it Mean in French? Crayons are sticks of colored wax, charcoal, chalk, or other materials used for writing, coloring, and drawing. A crayon made of oiled chalk is called an oil pastel. A grease pencil or china marker is made of colored hardened grease and is used for marking hard, glossy surfaces like glass. Water-soluble crayons are made by companies such as the Swiss manufacturer Caran d’Ache. The word crayon can be traced to 1644, and comes from the French word “craie”, meaning chalk, and the Latin word “creta”, which means Earth. 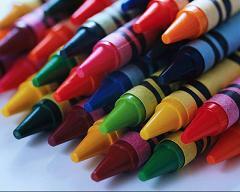 Some crayons are made of processed beef fat, or tallow, and is what gives crayons that distinctive crayon-y smell. Vegetarians can buy Wachsmalstifte crayons, imported from Germany and made with beeswax, or the new soy crayons, from Prang, made with paraffin and soybean oil. Which color crayon gets used up first in a box of crayons? Why do crayons smell so good and what are they made of? Which Crayola Crayon Names Have Been Changed To Be More Politically Correct?